Lama is a Marsokhod rover built by VNII Transmach in St Petersburg, Russia. It was bought by Alcatel Space Industries in 1995, and has been lent to LAAS in 1996. 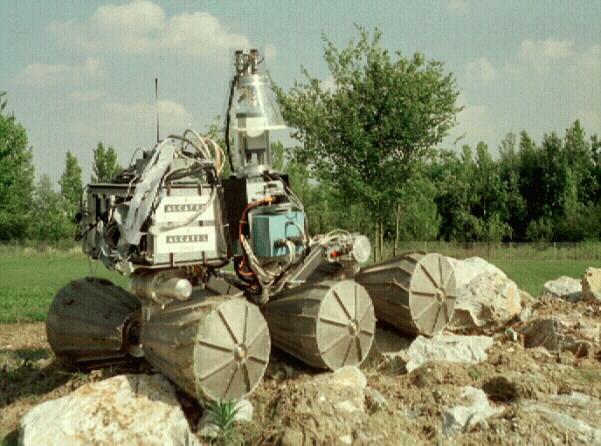 Most of our developments and demonstrations have been integrated within this rover (by the way, Lama stands for "Lavochkin Alcatel Model Autonomous"). During these years, Lama has quite much evolved: the prehistoric reptile turned into a modern, fully equipped rover (click on the images to get a bigger picture). Lama as it has been delivered to Alcatel in 1995. A bare chassis, with a blue box located on top of the middle axis that controls the motors. It is just a set of switches and electric relays, allowing only the execution of straight lines at two different speeds, and mere rotations. End of 1995, Alcatel put on some equipment: a magnetic fluxgate compass and a two-axis inclinometer are added. A VME rack containing two Motorola 68k boards allows to control the rover motions, and to gather all the proprioceptive informations (odometers, chassis angular configuration). One year after: now this is a rover. Each wheel is equipped with a high resolution optical encoder, and the blue box has been replaced by a set of servo-control boards, allowing very fine motion control. A stereo bench is mounted on top of a mast, and the images are processed on a PowerPC board. Ready for the third millenium: a second stereo bench is mounted on the front axis, on top of a AC/DC converters box that feed the motors and instruments or charges the batteries located inside the wheels. A fiber-optic gyrometer replaces the compass, and a differential carrier-phase GPS (lent by our colleague from CNES) helps to qualify the localization algorithms. More technical details about Lama can be seen here. Lama is not the only marsokhod robot in the world ! VNII Transmach produced several different marsokhod models: to our knowledge, the following ones existed once, or are still exploited. 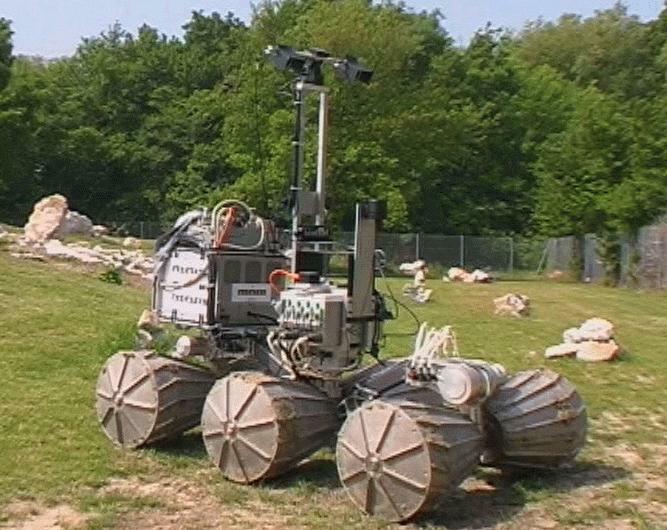 A bit smaller than Lama, this rover was in use at the Geroms experimental site in CNES in the late 90's. 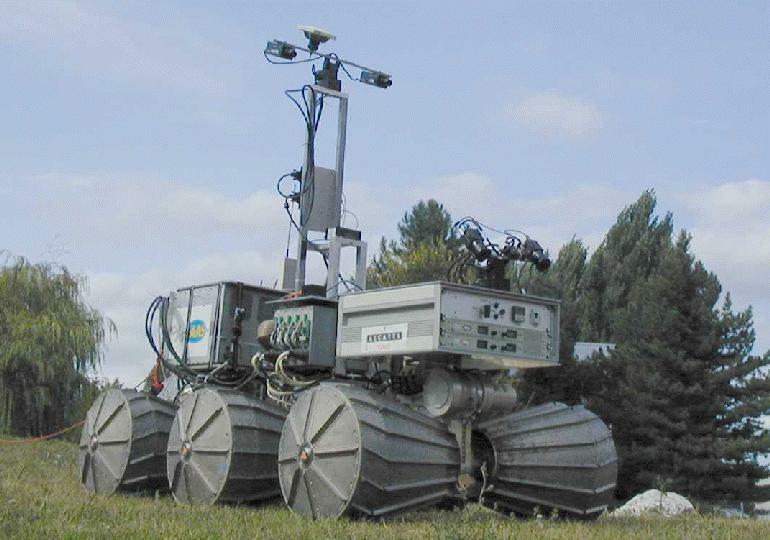 We rented it during two years, but it actually stayed at CNES and we didn't perform any serious work with it. Some details can be found here. This one is the same as Eve, and has been used for several years on the late 90's at Nasa Ames research center (is it still in use ?). 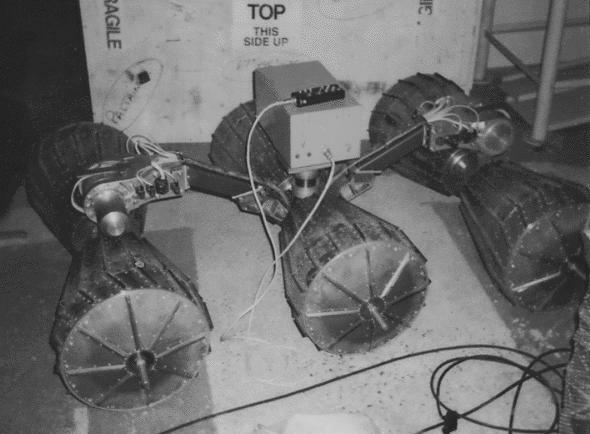 Some pictures of it during the Planetary Society Conference on Mobile Planetary Robots in 1997 (in the company of a russian twin brother) can be seen here. This one is neat, much smaller than the ones above (he has not the peristaltism motion mode). A video can be seen at the Monash Uni Intelligent Robotics Research Centre. Sara Fleury, Matthieu Herrb, Xavier "steelfingers" Dollat, Patrick "goldfingers" Marcoul, Christian Lemaire.